I’ve never been one to shy away from a challenge. So that’s why I decided to tackle the broadcast booth. The first time was in 2010 – the Carolina Panthers vs. the Cleveland Browns. I was totally overwhelmed and swore I would never go back. These announcers make it look so easy. But you’ve got to follow the plays, know everyone’s name, understand the runs, try to sound intelligent … and do it all while someone is talking in your ear. Lots of commotion, lots of noise, lots of distractions. It’s fast and thing change. Kind of like football, but when you’re on the field, you’re not talking to the world. My brother Terrence and I both prepared pretty well for life after the NFL. We have four businesses. Part of my job is to build our brand and help market the companies, especially the Holt Brothers Foundation. And part of that brand is football. 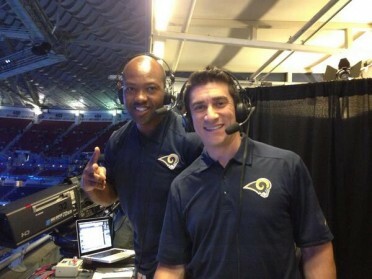 So when the chance came to get back in the booth with the Rams Broadcast Network … Well, I couldn’t say no. Two weeks ago was my first shot. This past Saturday, I was in the booth again. It was everything I remembered. But this time around I feel more comfortable. I spent time at Ram’s Camp, getting to know the guys. And just being in St. Louis feels natural. But there’s something you have to pay attention to that you didn’t have to back in 2010. And that’s TWITTER. So I’m talking to fans as I’m commenting. Crazy stuff. Let’s continue the conversation, folks. You can find me @BigGame81.